Atchison is located in a small tributary valley on the western bank of the Missouri River in northeastern Kansas. The city was founded as a "riverboat town" and has developed an industry based on transportation and agriculture. Atchison was home to the famous aviatrix, Amelia Earhart. The city is noted for its well-preserved Victorian architecture, and Benedictine College is situated on bluffs overlooking the Missouri River valley. The city has a riverfront park dedicated to Lewis and Clark. View downstream at Independence Park on the west bank of the Missouri River at Atchison, Kansas. Photo date 6/85; © J.S. Aber. Information sign at Independence Park, Atchison, Kansas. Photo date 6/85; © J.S. Aber. One of the United States' most important western railroads began in Atchison. The Atchison & Topeka railroad was chartered by the state in 1859, and the popular name Santa Fe was added in 1863 to become the Atchison, Topeka & Santa Fe. In some places the original route of the railroad was laid directly over ruts of the old Santa Fe wagon trail. The railroad was a financial success in the 19th century because of cattle shipping from such "cow towns" as Wichita and Dodge City. Following a series of railway mergers in the late 20th century, the Burlington Northern Santa Fe became one of the largest rail networks in western North America--with routes in 28 U.S. states and two Canadian provinces. Across the river, on the Missouri side, is Lewis and Clark State Park. The park includes an oxbow lake that was formed by meander cutoff of the Missouri River. Lewis and Clark called it Gosling Lake (Fanselow 1994); later it was known as Sugar Lake, and now it's named Lewis and Clark Lake (see maps below). 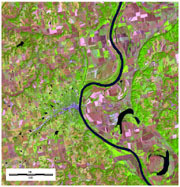 Similar oxbow lakes are present up and down the Missouri River valley and represent old meander loops of the river. July 4th, 1804 was the Corps of Discovery's first Independence Day en route, and the first one celebrated west of the Mississippi. They were camped at the mouth of a small creek, near Doniphan, about three miles (4 km) north of modern Atchison, Kansas. Their camp was located near an old Kansa Indian village. They recognized the day in appropriate fashion by firing the canon at sunrise and sunset, and the capitans ordered an extra round of whiskey for the men. In honor of the day, they named the small stream Independence Creek. The name is still in use today, and the creek forms part of the boundary between Atchison and Doniphan counties, Kansas. So magnificent a Senerey in a Contry thus Situated far removed from the Sivilised world to be enjoyed by nothing but the Buffalo Elk Deer & Bear in which it abounds & Savage Indians. 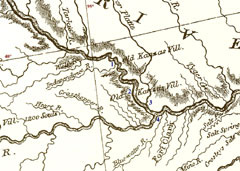 Portion of Clark's map showing the lower Missouri River. Key: 1 = old Kansa Indian village of the early 1700s. 2 = old Kansa Indian village during the time of Fort de Cavagnial. 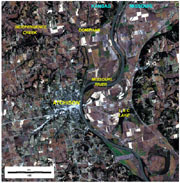 3 = mouth of the Platte River, below present Leavenworth, Kansas. 4 = Kawsmouth in modern Kansas City. 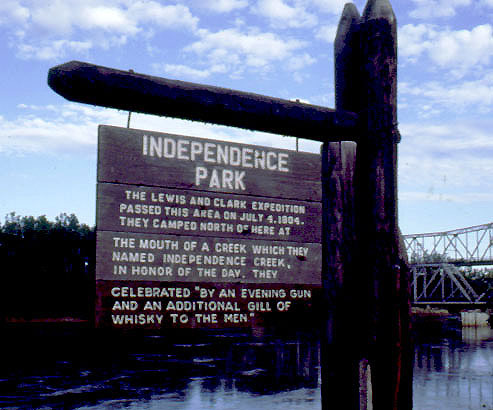 Notice the "Independence R." where the Corps of Discovery camped on July 4th, 1804. The map depicts many river meanders in this vicinity. Taken from a reproduction of Clark's original map; Oregon Historical Society Press © (1998). Click on small image for a full-sized version (209 kb). 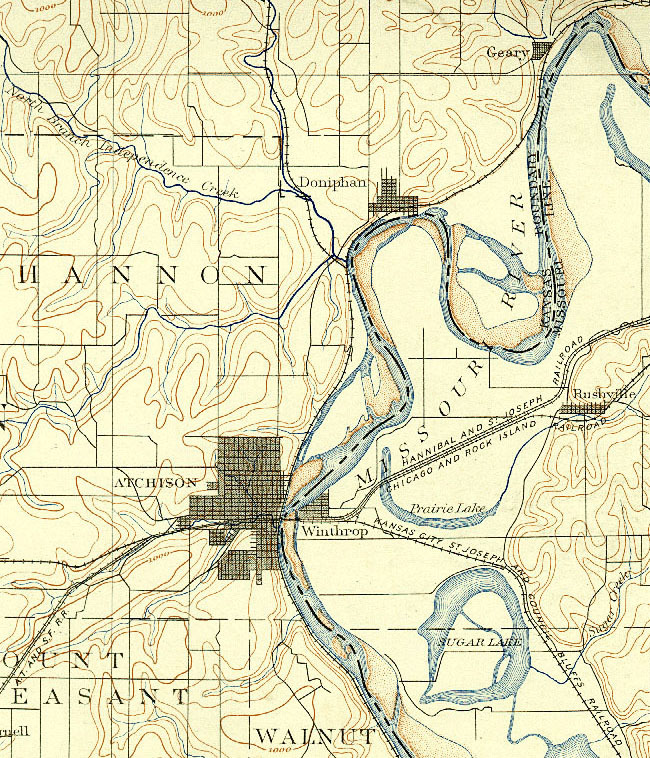 Portion of Atchison, KS/MO reconnaissance map, U.S. Geological Survey, edition of 1893. 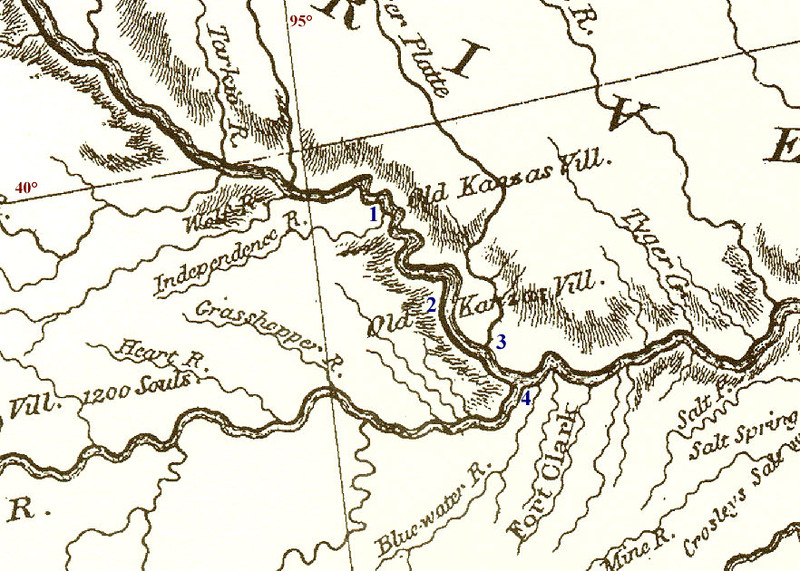 This map depicts the natural character of the Missouri River prior to channel engineering. Notice the broad, sandy channel with multiple chutes across meander bends, and several oxbow lakes. 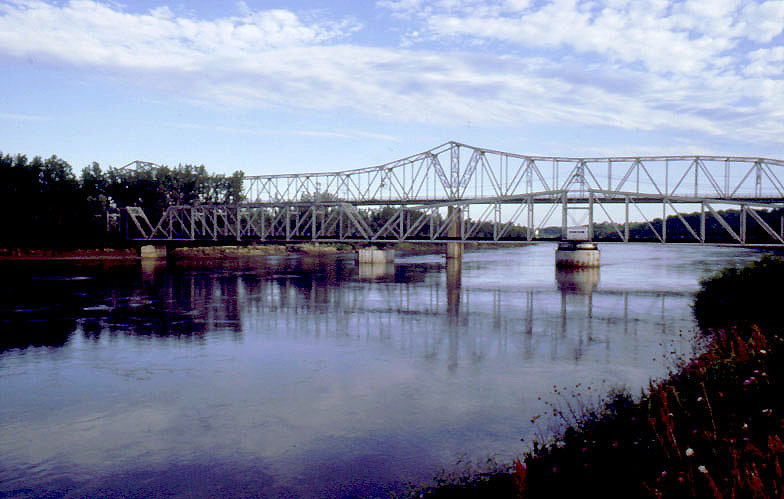 The small city Doniphan is located on the Missouri River near the junction with Independence Creek. 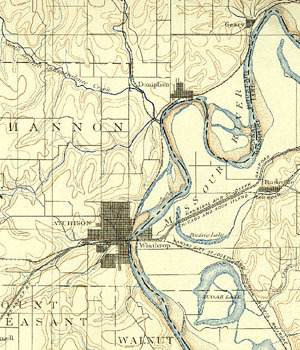 The Missouri River later shifted away from Doniphan, which is virtually a "ghost town" today--compare with modern map below. Click on small image for a full-sized version (287 kb). Modern map of Atchison, KS/MO, U.S. Geological Survey, edition of 1990. Notice the single, narrow channnel of the Missouri River today, as maintained by the U.S. Army Corps of Engineers. Independence Creek follows the old Missouri channel and now joins the Missouri River near Atchison. Compare with historic map above. Click on small image for a full-sized version (382 kb). The following images represent a single Landsat Enhanced Thematic Mapper Plus (ETM+) dataset that was acquired on Oct. 4th, 1999. Three composites of the same scene are presented to illustrate different aspects of the autumn landscape. Compare the images with the maps (above) to note major changes in the Missouri River, particularly in vicinity of Doniphan, north of Atchison. 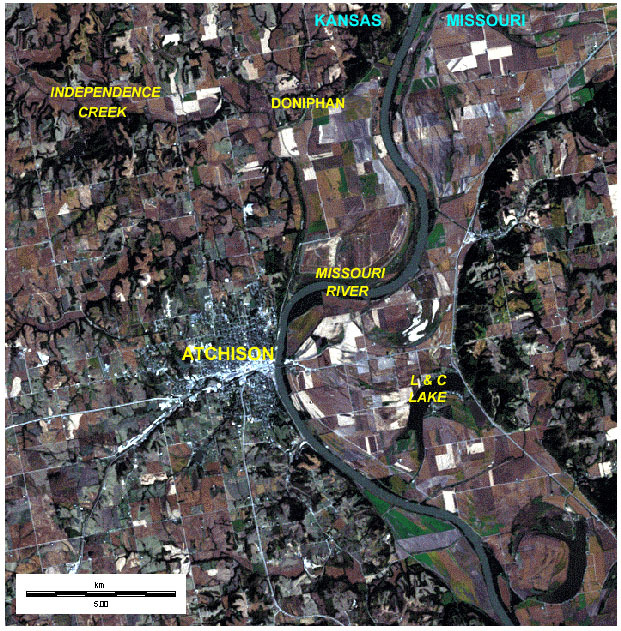 Natural-color composite Landsat ETM+ image of Atchison vicinity, Kansas and Missouri. Based on TM bands 1, 2, and 3 color coded as blue, green, and red. This image simulates the natural (visible) color of the landscape. Low (fall) sun angle creates noticable shadows along steep valley bluffs. White rectangles are harvested or fallow agricultural fields. 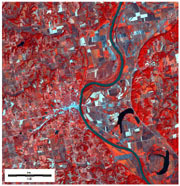 Standard false-color composite Landsat ETM+ image of Atchison vicinity, Kansas and Missouri. Based on TM bands 1, 2, and 4 color coded as blue, green, and red. Active vegetation (red and pink) is emphasized along with water bodies. Notice the black color of the oxbow lakes in comparison to the drab gray of the Missouri River. This is a reflection of muddy water in the Missouri River in contrast to clear water in the lakes. 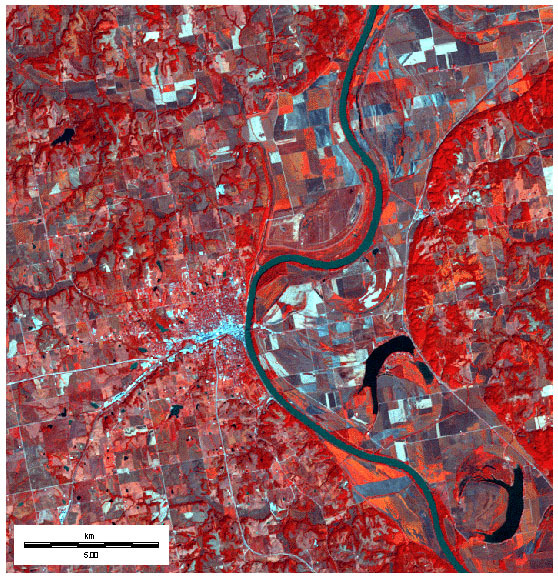 Special false-color composite Landsat ETM+ image of Atchison vicinity, Kansas and Missouri. Based on TM bands 3, 4, and 5 color coded as blue, green, and red. Active vegetation (green and yellow) is emphasized along with water bodies. 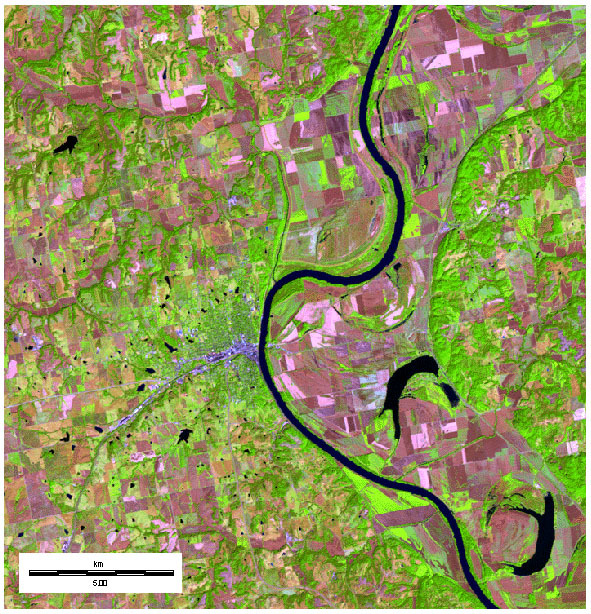 In this composite, all water bodies are black--even the muddy Missouri River. Tiny ponds and small creeks are easy to recognize. Panoramic photograph of Atchison, Kansas and the Missouri River (1909). From the Kansas Heritage Center, University of Kansas. History of the Burlington Northern Santa Fe--see BNSF. Return to Lewis and Clark atlas.